Oak Leaf Farm provides quailty care for your horse. Safety and comfort are key elements in keeping your equine athlete in top condition. Our facility is fully equipped with all the amenities you need to acheive your riding goals. Oak Leaf Farm has a beautful indoor arena with excellent footing that's availabe to rent on a hourly or daily basis. Having a hard time finding your prefect equine partner? Susan Hart can help you find just the right one for you! Have your child's next birthday party right here on the farm! Many different packages available. 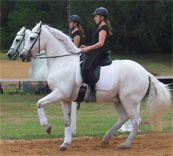 Oak Leaf Farm provides an excellent instruction and training program to help you obtain all your riding goals. Whether you want to compete or just go for a simple trail ride we can get you on the road to success. No matter what discipline you choose, having a solid foundation based on Natural Horsemanship creates the perfect partnership. A day camp for children ages 6 - 12 and 13 - 17 years old. This camp will increase your child's skills at all levels, from the beginner all the way up through advanced levels. Horsemanship is way more than riding! Children will not only learn the mechanics of riding but also how a horse thinks, why horses behave the way they do, and how to communicate with them using Natural Horsemanship techniques to form a wonderful partnership with these amazing creatures. Emphasis is on safety and fun in a non-competitive atmosphere.